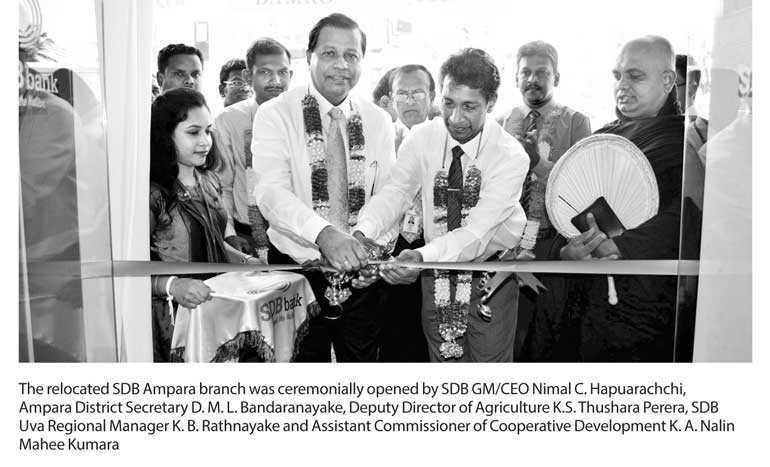 SANASA Development Bank’s (SDB) Ampara branch was relocated to its new premises on 23 August to No. 1017, D.S. Senanayake Street, Ampara, with the objective of providing more convenient and efficient service to its customers with more sophisticated facilities. It has been serving the area for nearly 10 years. The relocated Ampara branch was ceremonially opened with the participation of SDB General Manager/Chief Executive Officer Nimal C. Hapuarachchi, Ampara District Secretary D. M. L. Bandaranayake, Assistant Commissioner of Cooperative Development K. A. Nalin Mahee Kumara, Deputy Director of Agriculture K. S. Thushara Perera, SDB Uva Regional Manager K.B. Rathnayake, and other prestigious invitees. SANASA Development Bank PLC is a public quoted company with limited liability incorporated under the Companies Act 17 of 1982 and re-registered under Companies Act No. 07 of 2007 and registered as a licenced specialised bank by Central Bank of Sri Lanka under the Banking Act no. 30 of 1988, operates with an island-wide branch network of 93 branches. SDB has introduced a variety of banking products and services with a vast coverage of customers, from new born babies to senior citizens. Those products and services come under different brand names of Lakdaru Children’s Savings, SDB Dayada, Jawaya, Uththamavi, Upahara, Uththamachara, SDB Ayojana, Swarnakirana, SDB Leasing, SME Plus, Top Saver, etc.